The cool thing about this show is that we’ve actually started from scratch in terms of thinking of all the ways in which fans can touch “The Six.” There’s a show meeting at noon and from that show meeting up until the show starts at six o’clock on television, we’ll be using social platforms and digital platforms to give people glimpses into how we’re building ideas and to introduce unique content to certain social platforms to listen to fans who are on those social platforms and the topics they’re interested in. So by the time we get into the control room and start doing a show we will have already started a conversation with the audience that will continue through the live games. 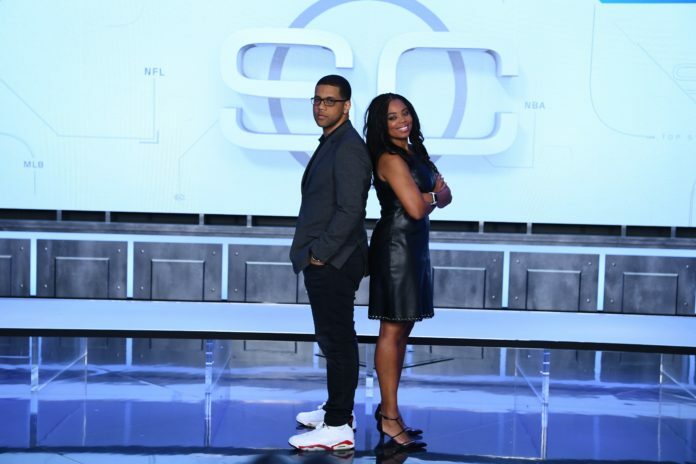 Michael and Jemele combined have more than 900,000 followers on social platforms so you match that up with the breadth of SportsCenter’s audience across Twitter, Facebook, Snapchat, Instagram and you’re talking about a huge scale on which Michael and Jemele, their audiences, and sports fans, in general, can talk to each other. In many ways, we view what’s going to happen in the social and digital space is as important as what happens from 6 p.m.-6:59 p.m. on television. In the end, that will be a watershed moment. In the past, we’ve embraced social and digital but we’ve built them largely as appendages; in this case, they live at the center of how we think of touching fans. That seems to have some promise, especially given how fans are consuming sports content these days. As we’ve often discussed on this site, there seems to be less and less interest in straight news and highlights, and both ESPN and Fox are adapting to that. Fox went with the drastic move of killing the news-and-highlights version of Fox Sports Live and turning it into more of a comedy-focused late night show, while ESPN has focused instead on making highly identifiable and individual versions of SportsCenter, from Scott Van Pelt’s show to SportsCenter A.M. and more. A personality-focused approach like they’ve taken with Van Pelt seems to be the goal for this new Smith and Hill show, and bringing social and digital into that makes a lot of sense. This show will be unique because it is an opportunity to look in on a conversation among close friends, colleagues and the people who they bring into their orbit by virtue of the topics they choose and the interests they have. Since we launched the midnight show with Scott Van Pelt, it’s been really clear that SportsCenter can be distinguished when it’s built around unique personalities and unique conceits, especially those ideas, personalities and conceits that work for specific audiences. The success of Scott at midnight has emboldened us to think about, “How do you feel when you wake up in the morning?” which is what we built SportsCenter:AM around. It definitely makes us think about that happy-hour time of day where the conversation around sports is really a conversation more than a moment to report something. But I should also say that Michael and Jemele are extremely capable of reporting news as it breaks and as it happens so we have high-level confidence there. I think people will also see that the music, the set design, the guest list and the way in which people sit on the set will all communicate a very different vibe around SportsCenter and it should be really cool. This is interesting, because in some ways it seems to be trying to walk the line between a debate show and the traditional SportsCenter. Smith and Hill certainly have backgrounds in opinion programming too (in addition to their journalism and reporting backgrounds, which King also notes) from Numbers Never Lie and its eventual evolution into His and Hers, and bringing some of that to the 6 p.m. SportsCenter may not be a bad idea (especially given how hard it is to first break anything on TV these days; plugged-in sports fans have already seen the stories, so a more in-depth discussion of them may be more interesting than a just the facts approach). However, everyone involved will need to take care to keep this informative rather than just opinionated, and conversational rather than just loud debate, or they’ll run the risk of alienating other people in the process. It sounds like this will retain a lot of the SportsCenter DNA, just with some twists, and that’s promising, but the question is how it will play out. We’ll have to wait and see there, but King’s stated goals for this SC 6 are certainly notable, and they’re quite different than what we’ve seen in the past. This show sounds absolutely awful. No interest at all from me. Great. Two black affirmative action babies spouting lefty crap. Exactly what no one I know of wants to see.